Some ill-informed or old school attorneys share a misconception that law firms do not need to prioritize quality client service. The belief is that achieving a positive outcome for the client is all that is necessary to turn a client into a life-long fan. 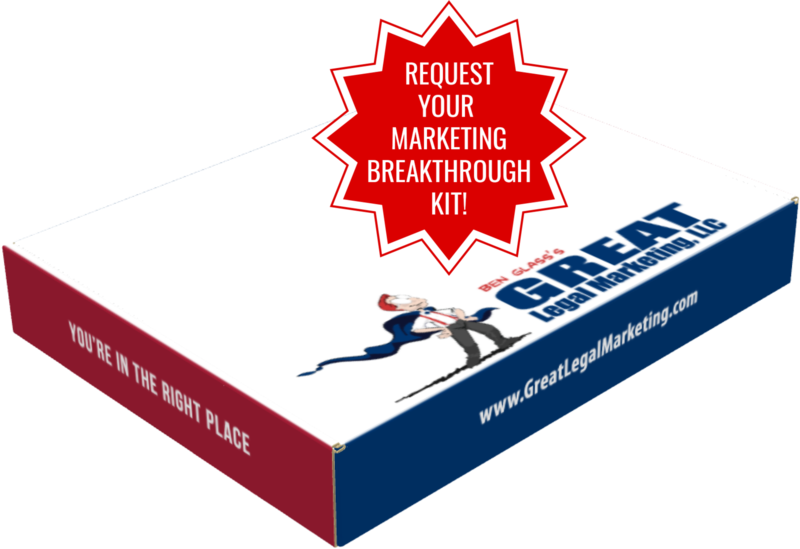 Receiving a positive result on a case is not enough to create a raving client. A pleased client? Yes. But a client that wants to write a review and tell his or her friends and family about you? Probably not. If you have doubts about the client service prioritization at my law firm, BenGlassLaw, just read a few reviews on my Avvo page. A way to stay in the mind of clients (or even potential clients) that compels them to refer clients to you and rave about you on social media is to provide above and beyond client service. This starts with staff members who perform client intake. The question to ask yourself is not, "What can this caller do for me?" Which really means: How much is this client worth, how difficult is the case, and how much time and effort does it require? The question to ask yourself is, "What can I do for this caller?" Now, I'm not telling you to accept cases that are difficult and do not hold much value. I'm telling you to connect that caller with a trusted attorney that is a right fit for the case or provide give the caller informative advice on how to proceed without an attorney. The level of customer satisfaction with a business directly correlates to the financial health of the business. (i.e. the better client service you provide the more money you will make). 86% of adults choose to pay more for a better client service experience. In a world with competing providers of the same services, excellent client service is one of the most effective methods of standing out. The top five reasons customers end services with a company is because: They do not feel appreciated, questions are not being promptly or accurately answered, employees are rude and/or unhelpful, phone calls are continuously transferred, and they are put on hold for an extended amount of time. In 2017, businesses that provided negative client experiences lost more than $75 billion in revenue. Just think about all of the money that you are letting slip through the cracks by not providing such a meaningful experience that it creates a lasting impact for your client. Employees should feel comfortable to make decisions to improve the client experience without your permission. If you give employees creative liberties to enhance the client experience, you'll see unique ways to make the client feel special. If comfortable with the idea, set a budget for employees to have to be solely used on quality client service and experience. A lot can be learned about quality client service from exceptionally client-focused companies such as Chick-fil-A, Trader Joe's, Amazon, The Ritz-Carlton, Zappos, and Disney World. There are countless concepts and ideas used by those client-focused companies that can easily be swiped and implemented in your law firm, you just need to look for them. One of the core values at BenGlassLaw is We Strive to Understand People. It is important to remember that the vast majority of people are not happy about hiring an attorney. The client can be going through one of the worst moments of his or her lives. By being empathetic and patient with the client you are providing a genuine experience and removing stressors from the situation. Don't Underestimate the Power of a Genuine "You're Welcome"
At their core, clients really just want to know that you care. They want to feel like a person, not a case number. While the goal is to have a positive case result, that is not what shapes the client experience. Clients now more than ever want the brands and services they use to have values aligned with their own. Community marketing enables you to show the values and causes you care about. Acknowledge and appreciate the positive feedback and also respond appropriately to the negative feedback. While it is tempting to either ignore the negative comment or defend yourself, clients want their voice to be heard. Most negative feedback comes from a genuine place of concern and that they want something to improve. Start small. Personal thank-you letters, small gifts and tchotchkes go a long way in the mind of the client. Follow-up after the case is settled just to check in on them. Whatever you think would be a good idea and create a lasting impact with the client, do it.